Non–small-cell lung carcinoma (NSCLC) is often fatal because most cases are not diagnosed until they are so advanced that surgical intervention is no longer possible. To improve outcomes researchers are developing a blood test to detect lung cancer earlier in the disease. 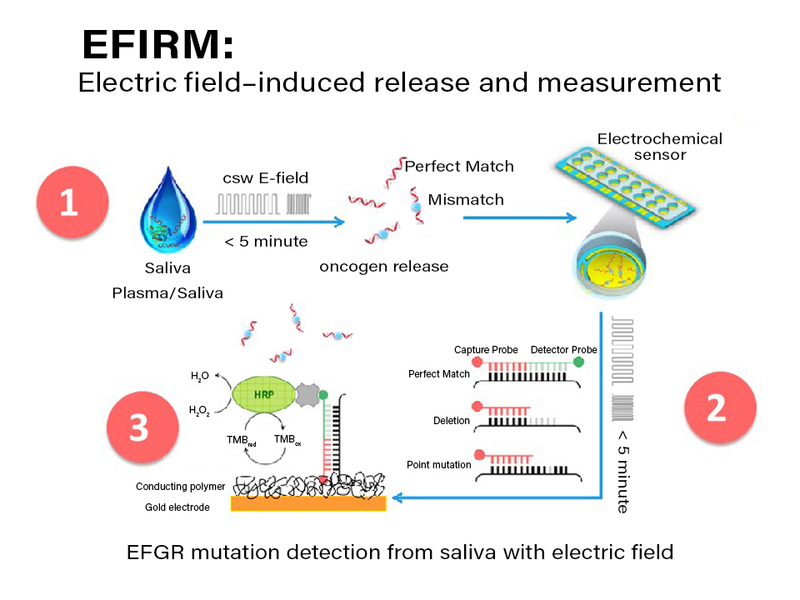 A report in The Journal of Molecular Diagnostics describes a new technology, electric field–induced release and measurement (EFIRM) that is both highly sensitive and specific in detecting two epidermal growth factor receptor (EGFR) mutations associated with lung cancer in the blood of NSCLC patients with early-stage disease. This platform is relatively inexpensive and capable of high-throughput testing. Despite advances in chemotherapy, five-year survival for patients diagnosed with unresectable NSCLC is less than 10 percent. The ability to diagnose NSCLC in stages 1 and 2, when surgical resection and potential cure are still possible, could significantly reduce the mortality from NSCLC worldwide. “The revolutionary EFIRM technology is the most exciting development in noninvasive liquid biopsy in recent years. The potential to detect early-stage lung cancer patients with an affordable blood or saliva test could save thousands to tens of thousands of lives annually worldwide,” stated Charles M. Strom, MD, PhD, co-director of the Center for Oral/Head and Neck Oncology Research at the UCLA School of Dentistry, Los Angeles, CA, USA, and Senior Vice President and Chief Medical Officer of EZLife Bio, USA, Woodland Hills, CA, USA. The EFIRM technology can also be used to monitor treatment and detect recurrence in patients already diagnosed with NSCLC. Previously, the investigators had successfully measured two actionable EGFR mutations (p.L858R and Exon 19del) in blood samples from patients with late-stage NSCLC using EFIRM technology. In the current study, they investigated whether the mutations could be found in samples from patients with early-stage disease. The researchers collected plasma samples from 248 patients with radiographically-determined pulmonary nodules. Of those, 44 were diagnosed with Stage I or Stage II NSCLC (23 with biopsy-proven benign pulmonary nodules and 21 with Stage I or Stage II adenocarcinoma). EFIRM was able to detect the p.L858R mutation in 11 of 12 samples and the Exon 19del mutation in seven of nine samples, resulting in greater than 90 percent sensitivity and 80 percent specificity. The steps involved in the electric field–induced capture and release (EFIRM) assay are shown. Initially, allele-specific capture probes are immobilized in a conducting polymer gel at the base of each well in a 96 well plate. Subsequently, a small amount (20 to 30 ncl) of untreated saliva or plasma is added to hybridization fluid and added directly to the well (step 1). Subsequently an alternating electric current is applied causing allele-specific hybridization. In step 2, a biotinylated signal probe is added to each well and another electrically stimulated hybridization is performed. Finally, in step 3 a standard streptavidin/biotin/horse radish peroxidase (HRP) signal amplification is performed causing electrons to be drawn up through the gold electrode and the current in nanoamperes is measured by the EFRIM reader. Credit: Fang Wei, EZLife Bio. Investigators emphasize that this study does not present direct evidence that detecting EGFR mutations in the plasma of an individual is predictive that the patient has cancer. Future work will explore whether finding an EGFR mutation in the circulation has any predictive value. Currently, the EFIRM liquid biopsy may be helpful for guiding treatment selection in patients for whom biopsy material is not available. “We are gratified by the performance of the EFIRM platform in patients whose tumors were still small enough to qualify for surgical care. Work is underway to increase the number of mutations analyzed and to automate the process to increase sensitivity and facilitate mass screening,” commented Dr. Strom. The article is “Electric Field–Induced Release and Measurement Liquid Biopsy for Noninvasive Early Lung Cancer Assessment,” by Fang Wei, Charles M. Strom, Jordan Cheng, Chien-Chung Lin, Ching-Yun Hsu, Guy W. Soo-Hoo, David Chia, Yong Kim, Feng Li, David Elashoff, Tristan Grognan, Michael Tu, Wei Liao, Rena Xian, Wayne W. Grody, Wu-Chou Su, and David T.W. Wong (https://doi.org/10.1016/j.jmoldx.2018.06.008). It will appear in The Journal of Molecular Diagnostics, volume 20, issue 6 (November 2018) published by Elsevier. Full text of this study is available to credentialed journalists upon request; contact Eileen Leahy at +1 732 238 3628 or jmdmedia@elsevier.com. Journalists wishing to interview the study authors should contact Dr. Charles M. Strom at CStrom@mednet.ucla.edu. This study was supported by NIH grants UH2 CA206126 EDRN, UH3 TR0000923, UO1 DE-15018 (UCLA Collaborative Oral Fluid Diagnostic Research Center), and U01 DE017790 (Oral Fluid NanoSensor Test), the GSK/IADR Oral Health Innovation Award (2011-2103), and the EZLife Bio Fund for Excellence. Wu-Chou Su is supported by the Center of Applied Nanomedicine, National Cheng Kung University from The Featured Areas Research Center Program within the framework of the Higher Education Sprout Project by the Ministry of Education (MOE) in Taiwan.